Temporarily Disable Night Shift on a Mac? I like using Night Shift on my iMac to cut out the blue light and help slow down my brain at night. Except occasionally I need to work on editing some graphics and need the full spectrum to ensure I’m seeing accurate colors. Is there a way to quickly disable Night Shift? 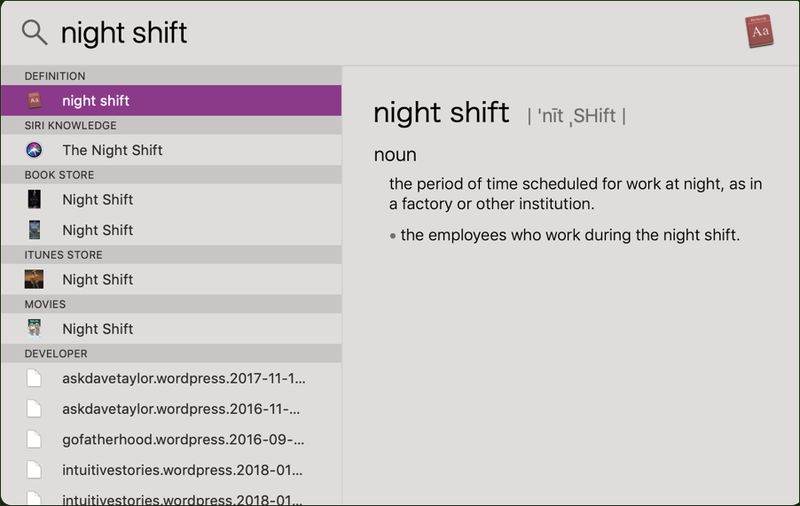 I’m also a fan of “Night Shift” on the Mac system; it’s a smart and effortless way to filter out some of the blue spectrum light from your computer screen as the evening progresses so that your brain can slow down and you can get to sleep when you go to bed. it’s bad enough we spend so much time of an evening looking at screens, but to be kicking up your brain chemistry because it thinks you’re still in daylight, well, it’s enough to lead to some pretty serious insomnia. As you point out, however, the problem with Night Shift is that if you need to accurately see the colors of a graphic, video, or photograph, it’s up to you to remember that Night Shift is going to affect color reproduction and potentially cause you to adjust the image to compensate. I know because I do the same thing, editing videos late into an evening sometimes even while Night Shift is filtering out the blue. Modern problems, undoubtedly! There ya go! 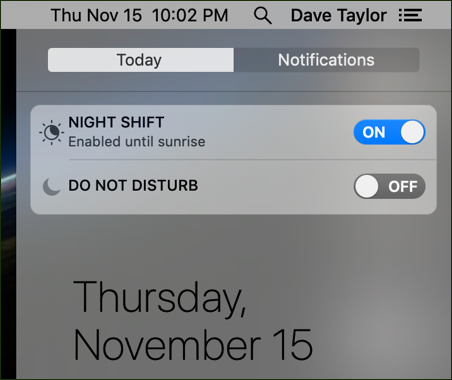 The handy shortcut for Night Shift on your MacOS X system – whether it’s an iMac, MacBook Pro, MacBook Air or any of the other systems running MacOS – and the similarly handy way to enable “Do Not Disturb” too. Not sure what Do Not Disturb is? You’re not alone. Here’s how Apple describes it: “Banners and alerts will be hidden and notification sounds will be silenced.” In fact, lots of Mac users have it permanently enabled! That should get you all set up! Pro Tip: I’ve been writing about Mac and MacOS X since the beginning of the Macintosh system. You can find tons of Mac help here on the site too, so please take a few minutes and check it out!